The latest implementation now includes materials. These materials include a diffuse texture, diffuse colour, normal map, roughness value, roughness texture, and reflection amount. Check if we hit an object. If we hit nothing, draw the sky gradient. Draw the ambient light value. Draw the Diffuse texture and colour to the diffuse layer. Calculate the normals using the model normal mixed with the normal map. Calculate the current surface roughness. 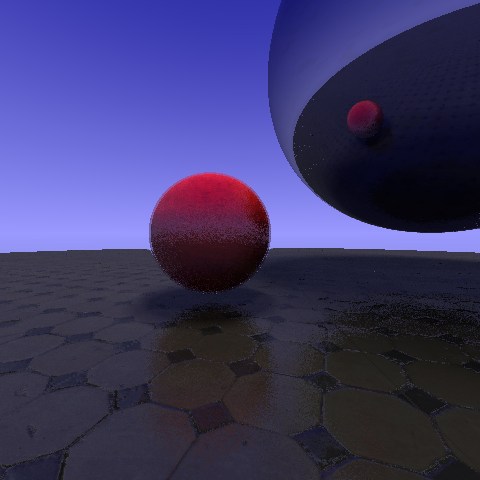 Calculate the specular texture, store the roughness in the alpha channel. For each light calculate the specular and diffuse colours based on the light. The final result is starting to look pretty good. The textures for this tutorial we’re obtained from texture.com. If you’re not familiar with this sight, I highly recommend it for realistic textures. Almost there, next I’ll be working on the dynamic models and refraction. 8 - Show the last diffuse texture frame. 9 - Show the last specular texture frame.